This tutorial will guide you step by step into the creation and customization of an Advanced Installer Professional project. It is addressed to those who have completed the Simple Installation tutorial. For the editor to function properly some registry keys must be present on the target system. Suppose this editor is developed using Visual Basic. In order to work, it needs Visual Basic 6 Runtime to be installed on the target machine. It has a type of file that it associated to, called, say, EDI file. After launching Advanced Installer, you will be presented with a dialog where you can choose the type of the project you want to create. Now you can see the main view split into two panes. In the left pane, you can see all the options you have to edit in your current project, grouped in categories. Switch to “Product Details” page to set the information seen by the user for your installation package. Fill the fields in the right pane with the corresponding data. For further information about this page please see Product Details Tab. 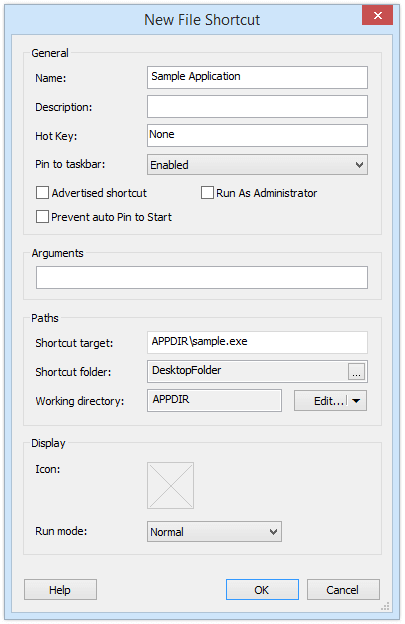 Set the default installation paths for the "Application Folder" and "Application Shortcut Folder" by using the combo boxes or the [ Edit... ] button. You can edit these fields, but the values from the combo boxes are the most common ones. 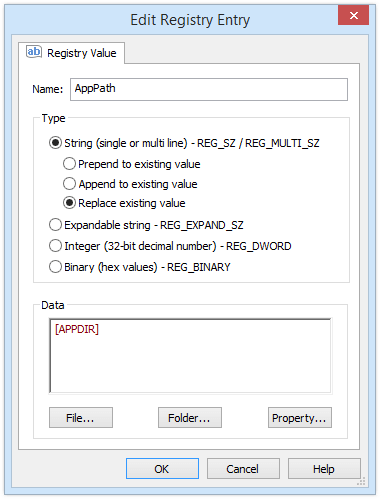 Click on the [ Add Files ] toolbar button and select the files of your application, use our Sample Application. Repeat this step to include the Foo.edi file you have created. Once the files are added, their names will appear in a list in the right-side pane of the view. Now, let's make a shortcut to the Sample.exe file you just added. Right-click on this file and choose “New Shortcut To -> Installed File”. In the newly appeared dialog choose a name for your shortcut and a location - like in the following screenshot. Press the OK button and the shortcut will appear listed in the application shortcut folder. The other one is named "AppSettings" and contains a value that shows the current settings of the application. On install, it has the value "36". In the "Name" text field enter the name of your first key: "AppPath". Press the [ Folder... ] button and select "Application Folder". Since "Data" is a Formatted Type text field the value that it contains will be expanded at install time into the full path to your application's location. Go to the "System" tab of the "Launch Conditions" page. If you wish that your application should be installed only on a particular set of operating systems make sure that the rest of the operating systems are not ticked in the view. Description: This application cannot be installed because of the file "C:\example.txt" does not exist. A short video with the steps listed above. Let's suppose that your application requires the "My Application.exe" installation package to be installed. 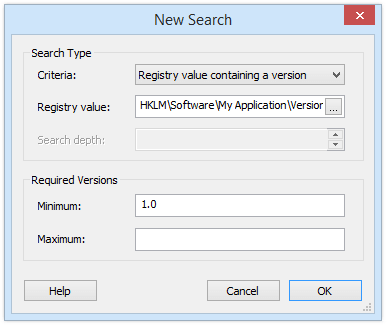 This package will install an application and it will create the registry entry HKEY_LOCAL_MACHINE\Software\My Application\Version with the value 1.0. 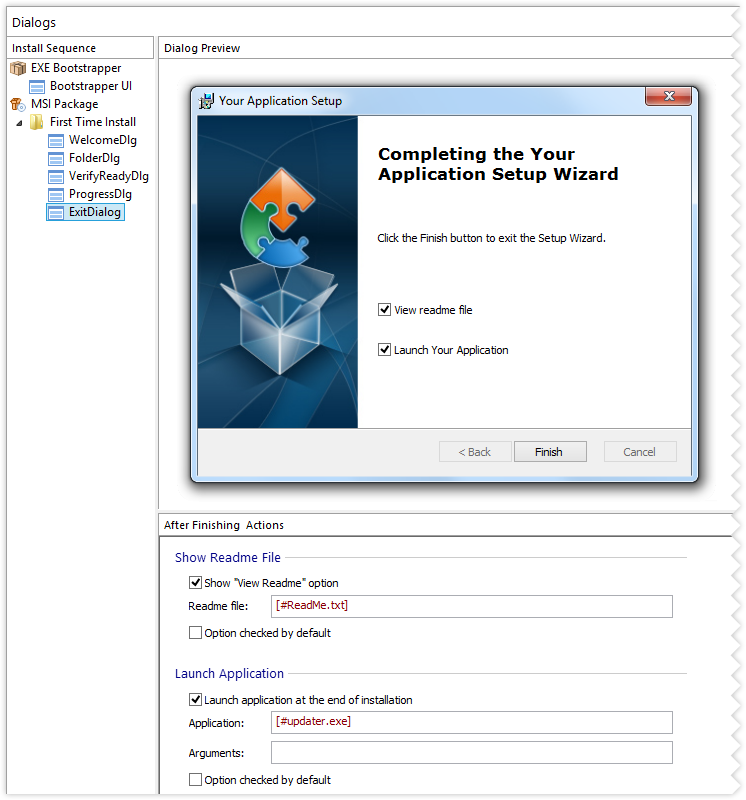 If this application is not already present on the target machine, your package will have to install it before deploying your application. For this, you can use the "Prerequisite" feature. 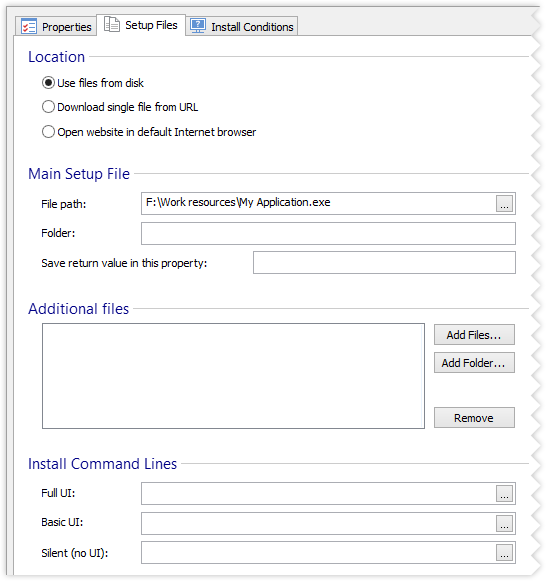 You can also set the location of the prerequisite as a URL from where the file can be downloaded, by selecting "New URL prerequisite" from the context menu. Or, you can use the "New Prerequisite Wizard" option from the toolbar to guide you through defining your prerequisite. 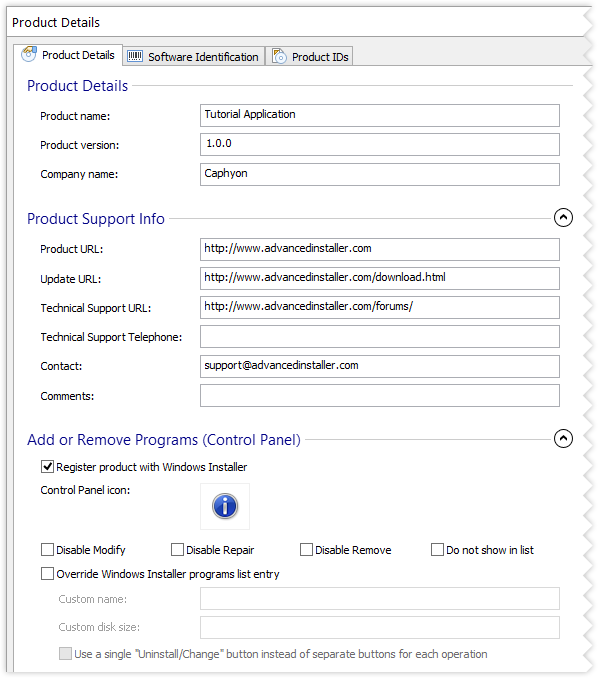 Advanced Installer comes with a list of commonly used prerequisites, for which all the settings are already defined. 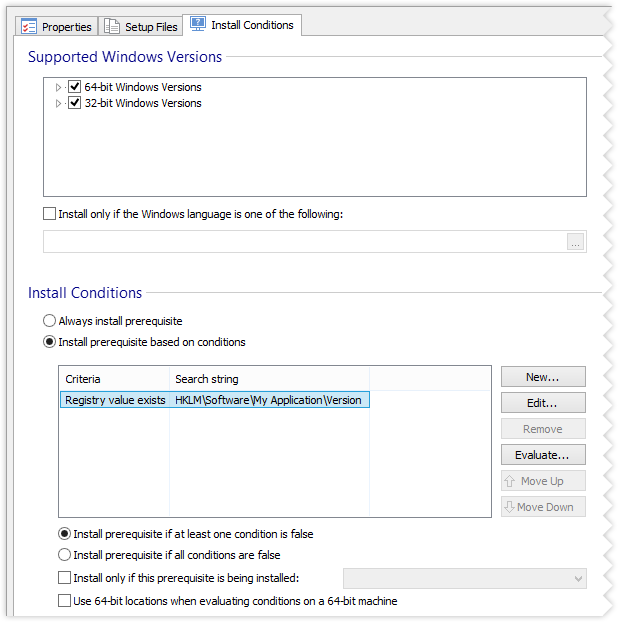 After the properties of the prerequisite have been set, you need to set the detection criteria by using the Install Conditions tab. For every extension contained in your application, you need to add at least one verb. The name of the verb will be seen in the context menu that appears when you right-click on a file of "edi" type in Windows Explorer. In this example, you should leave the defaults settings. 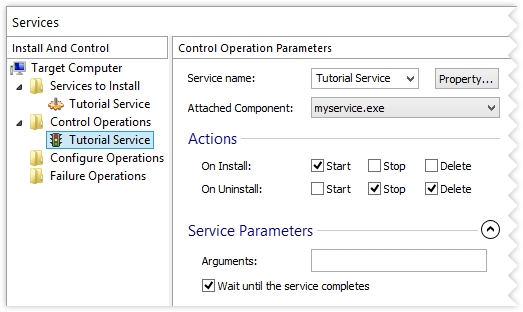 The effect is that when you double click a file or you choose the "Open" action from a context menu of an "edi" file, the application is automatically launched with the command line argument specifying the absolute path of the chosen file. 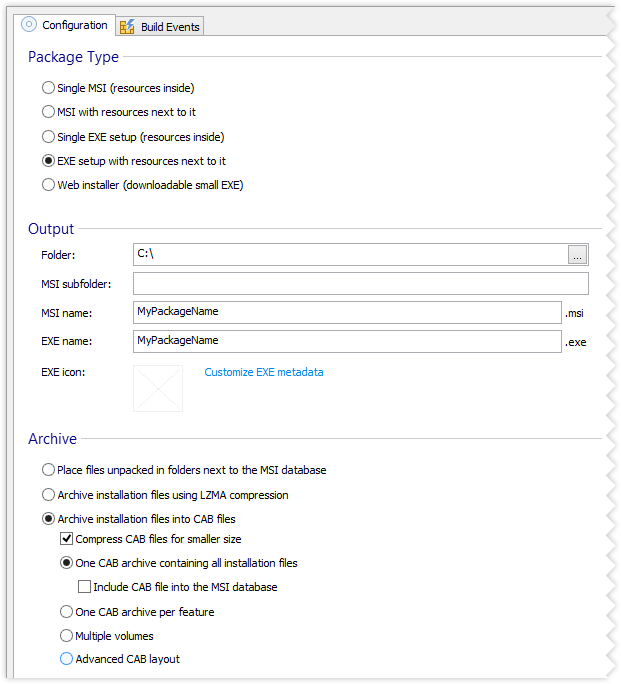 To test if the file associations are working properly, look in the folder where you have installed the program and double-click the EDI file. This should open using Sample.exe that you have installed. 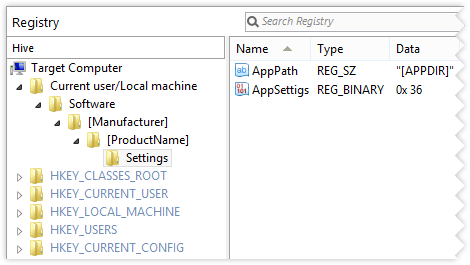 Also, you can verify the value written in the registry for AppPath using Regedit.exe. 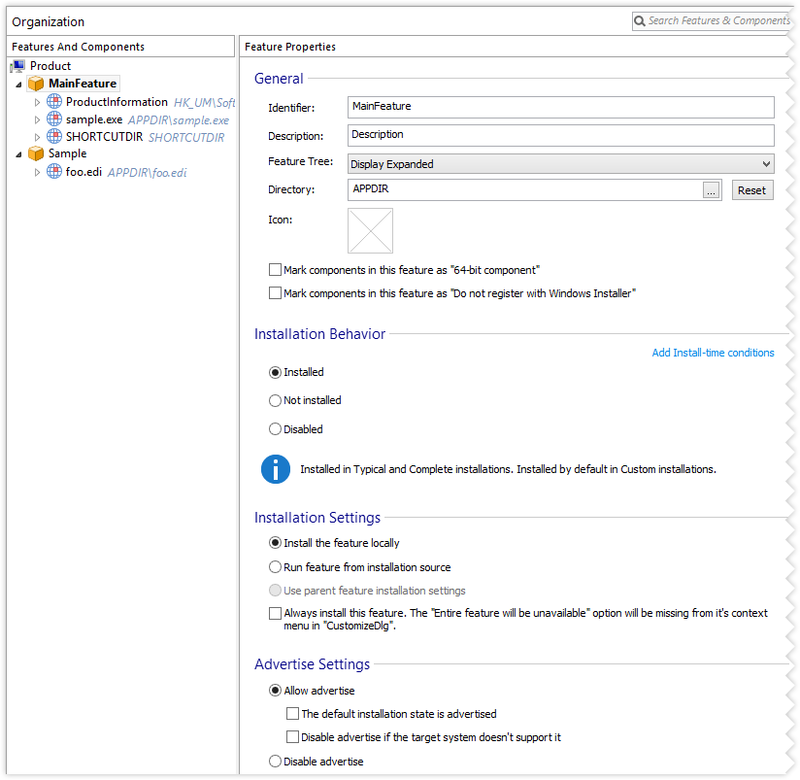 Giving the user the possibility to install only some part of your application can be done easily with Advanced Installer. To do this you must organize your application into several features. At this moment, all your files are included into a single feature, called "MainFeature". Create a new feature that contains the "foo.edi" example file. In the "MainFeature" only the "Sample.exe" component will be present. For more details about features and components see the Organization page. A dialog for displaying a license agreement text. 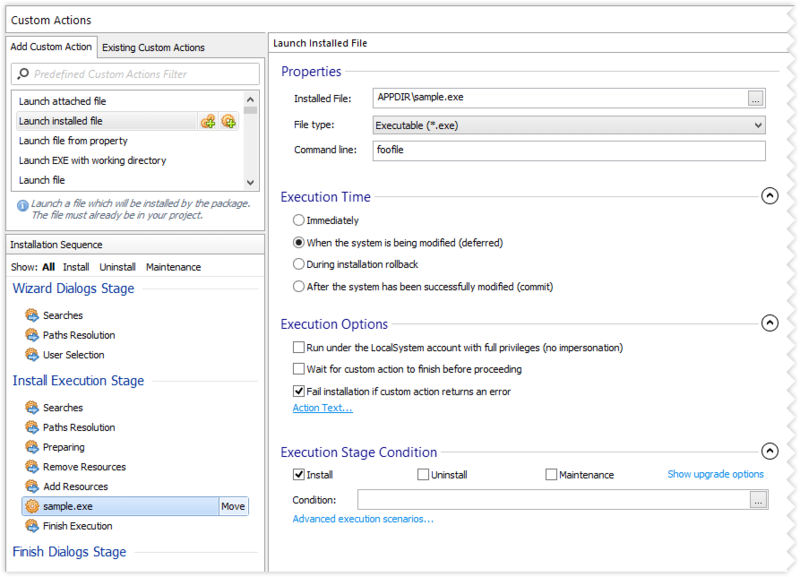 This will allow the user to choose to view the ReadMe file or to launch the application at the end of the installation. Right-click the Welcome dialog from the left-side pane. Choose “Add Dialog” from the context menu. Repeat the previous procedure but select the “LicenseAgreementDlg” dialog from the “Add Dialog” window. Click on the [ Browse ] button from the right-side pane to select from your machine the Rich Text Format file containing the license agreement. Add to your package the ReadMe file for your application (use the “Files and Folders” options page). Select the “ExitDialog” dialog from left-side pane. In the right-side pane, check the “Show "View ReadMe" option” checkbox; you will be prompted to choose the ReadMe file. Choose the file you just added to your package. 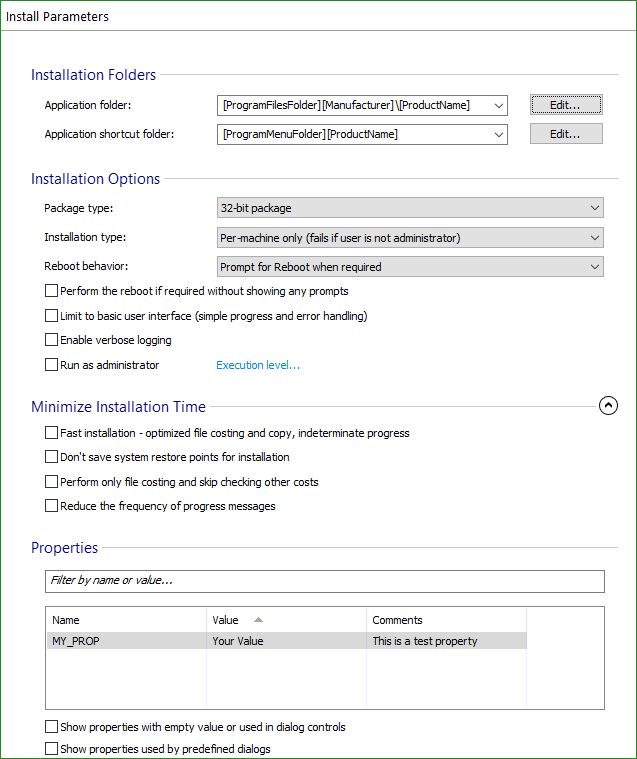 Check the “Launch Application at the end of installation” checkbox and select from your package the application that will be launched at the end of the installation. Let's suppose your application needs some information stored in an environment variable. 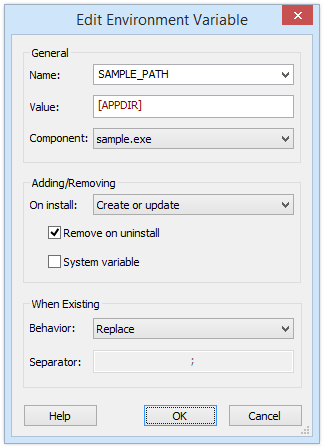 In our example, we will add a variable - "SAMPLE_PATH" - that will contain the path to the folder in which your application will be deployed. Click on the [ New Variable ] toolbar button and fill the fields of the newly appeared dialog. Select “Custom Actions” in the left pane in order to add a Custom Action. 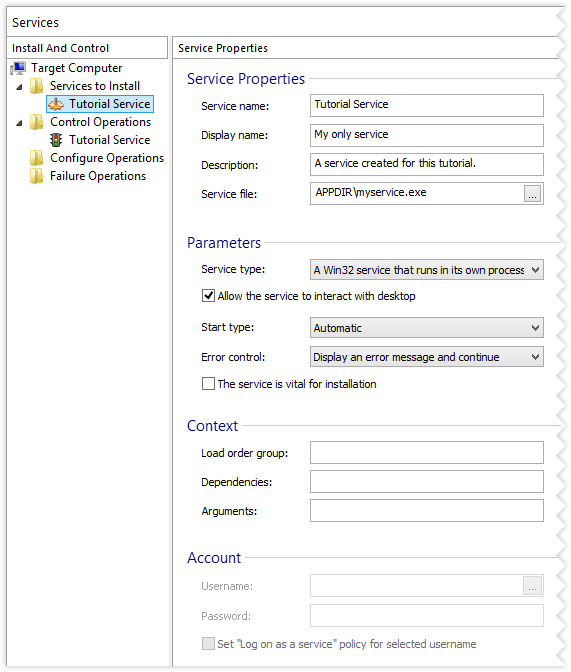 Select the "Install Execution Stage" -> "Add Resources" action group in the left-side pane. Choose from the toolbar “Launch installed file”. Select from the FilePicker dialog the "Sample.exe" file (you included this earlier in your project). In the command line field pass the string "foofile". The effect is that Sample will try to open this file. If "foofile" doesn't exist on the target machine, Sample will ask the user whether it should create a new one. This is how the command line arguments behave. Click on the [ Add merge module ] toolbar button and browse to your msm file. In the"Preview" tab you can change the banner showed on the dialogs and the background from the first and the last dialog. Choose one of the Advanced Installer predefined images or you can use one of your own by expanding “More options” and double-clicking “DialogBitmap” or “BannerBitmap”. For more information please see the Themes page.